The 900JF and 930JF series feature a new JAWSFIT cross-point tip design. Small projections on the blade edges allow the tip of the screwdriver to "BITE" firmly into the screw head, reduce pressing force, prevent driver tip damage, and help prevent cam-out. Applications include construction, automotive, industrial use, general fastening, and more. 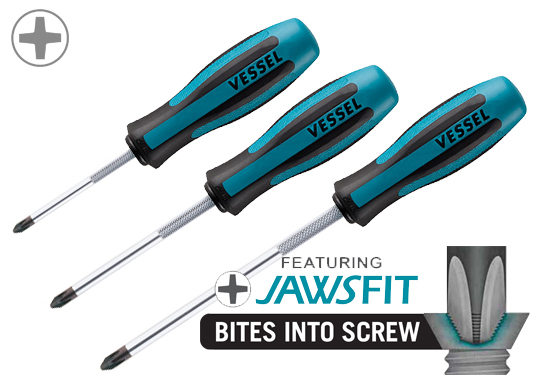 NOTE: The 900JF and 930JF JAWSFIT feature is not intended to be used when working with soft or plated screws, and may not be suitable for restoration work. The "JF" JAWSFIT models are equipped with the most advanced triple-molded handle for comfort. The corners of the hexagonal cross-section are molded with elastomer for a soft fit and high torque transmission.